The bust size of your dress corresponds to the diameter of your bust measured in inches. 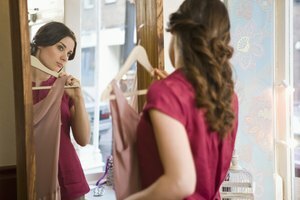 The size of your dress's bust will help you to know whether it is likely to fit without you having to try it on. For example, if your bust size is a 36B and your dress measures at 34 inches, you know that you should try on a bigger size. Bust sizes can be altered and taken in if they are too big, but it is difficult and sometimes impossible to let out a seam to make the bust bigger. Lay your dress down on a flat surface. Make sure the bust of the dress is flat and uncreased. Wrinkles may affect the measurement. 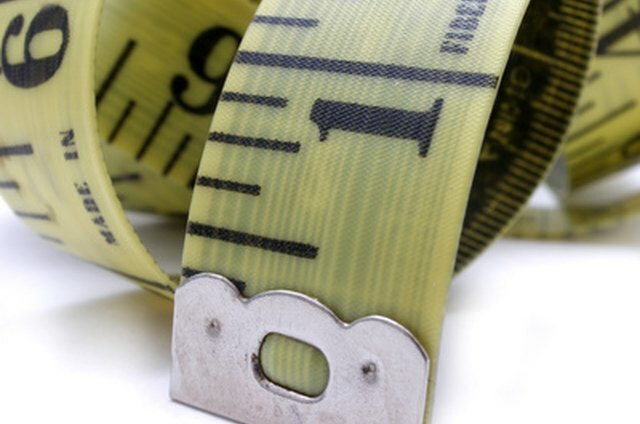 Line up the "0" on the measuring tape at the far left edge of your dress's bust. The bust is the widest part of the dress's chest area. Lay the measuring tape along the bust of the dress. Make sure the tape is not pulled so tight that it causes a crease in the dress, but don't allow any extra slack either. Lay the tape across gently and make sure that it does not have any creases or wrinkles in it. Record the number on the tape that hits the right-hand edge of the dress's bust. Multiply the number by two. For example, if the front bust of your dress is 17 inches and you multiply it by two, then your dress's bust measurement is 34 inches. This is the number you should compare your own bust measurement to in order to decide if the dress is likely to fit. A dress that has a high lycra content and is stretchy might fit over your bust, even though its measurement suggests otherwise. Dresses that have stretch to them are best tried on rather than measured.